Our surgeons use modern, minimally-invasive neurosurgical concepts to correct problems in the brain, spine and skull. At Dallas Brain, Spine, and Skull Base Surgery, we offer convenient online appointment scheduling for our patients. Dallas Brain, Spine, and Skull Base Surgery is a neurological practice that offers over 20 years of experience providing innovative, state of the art and a collaborative team approach to the care of patients from around the world with challenging neurological problems. Our practice has developed unique expertise in the treatment of brain tumors becoming the referral destination for the treatment of patients, especially those with complex or difficult to access tumors. We have also shown a commitment to the development of minimally invasive neurosurgical procedures including the most modern expanded trans-nasal endoscopic skull base surgical techniques and focused extradural approaches to skull based tumors. Both of these procedures are routinely used in our management of a variety of pathologies. In addition to our unique focus on brain tumor surgery, Dallas Brain, Spine, and Skull Base Surgery has also used these techniques in the treatment of other neurosurgical diagnoses including but not limited to, cerebral aneurysms, trigeminal neuralgia and spinal cord tumors. Dallas Brain, Spine and Skull Base Surgery is fully committed to providing comprehensive care for patients with spinal disorders. Our practice distinguishes itself from the majority of other spine surgery practices for its singular preference and long-time experience in the treatment of lumbar spine and cervical spine diseases without the use of spinal fusion or metal instrumentation whenever possible. This unique commitment avoids the potential, both short and long-term, of the undesirable consequences of spinal fusion and metal instrumentation with screws and plates to a select group of our patients. 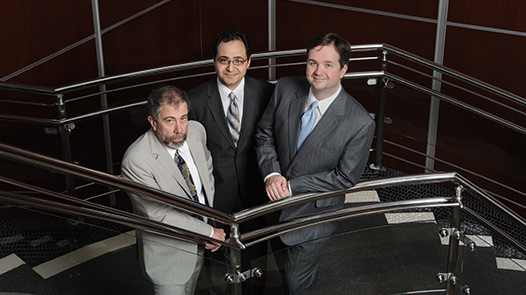 Dr. Coimbra, Dr. McGowan and Dr. Beshay believe in customized patient care and a team approach to medicine with attention to careful selection of the least invasive and most effective treatment for each patient. Our commitment to this philosophy has resulted in maximum preservation of function, less discomfort, shorter hospital stays and durable favorable outcomes for our patients. Dr. Beshay has been named one of D Magazine's Best Doctors for 2016.